Select a material Bloodwood Cherry Purpleheart Bubinga Walnut Maple Surprise Me! I worked with my Mom (who loves to weave!) to design these wonderfully useful shuttles! The little finger makes separating warp strings a breeze, and is also great for patterns that require picking single strings. They all have a blade like edge that is great for beating and gliding between strings. Then the shuttles are sanded till they're super smooth, and buffed with a natural beeswax blend. The finger pick shuttles are around 5 1/2" x 1 1/2" on average and are 1/4" thick. These wonderful shuttles are made of various types of exotic hardwoods to choose from! Check the second picture in the listing for the examples of the different woods. 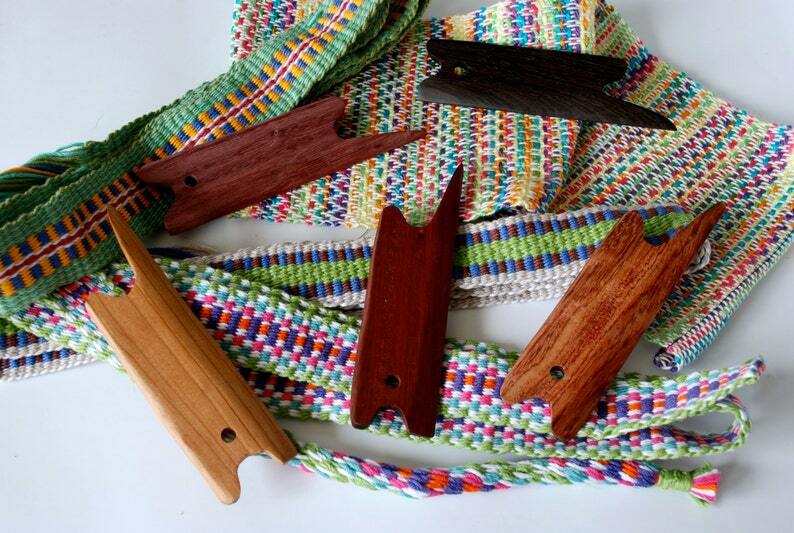 You can use our shuttles for any number of weaving and crafting purposes including inkle, tablet, box, rigid heddle, sami, card, and small detail work! Be sure to check our other listings, as we have many shuttles for all styles, along with lots of other useful and unique fiber tools! All woodworking products are hand-carved so there will be some variation in sizes and appearance. If you would like one of our shuttles in a custom size, let us know and we will see what we can do! Shipped quickly. The shuttle is very nicely made and smooth. This is a beautiful shuttle. I haven’t used it yet but it feels great in the hand and is beautifully finished.